On our way out west we are passing by some areas that we visited a couple of years ago. 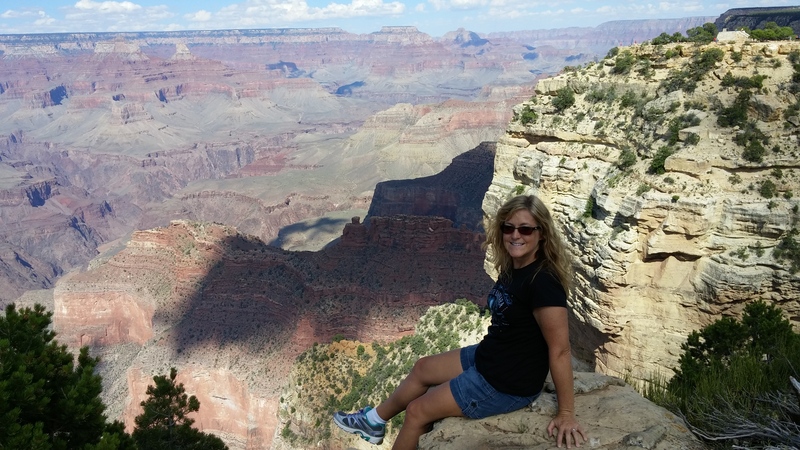 Grand Canyon is one of those that is worth repeating. We were excited to be there when they got a little bit of snow. We don’t see snow very often so this was a treat for us. Arizona does not observe daylight savings time so at this time of the year they are on the same time as Pacific. That means that the sun comes up pretty early in the morning and we were up bright and early to witness our first snowy day of 2017. 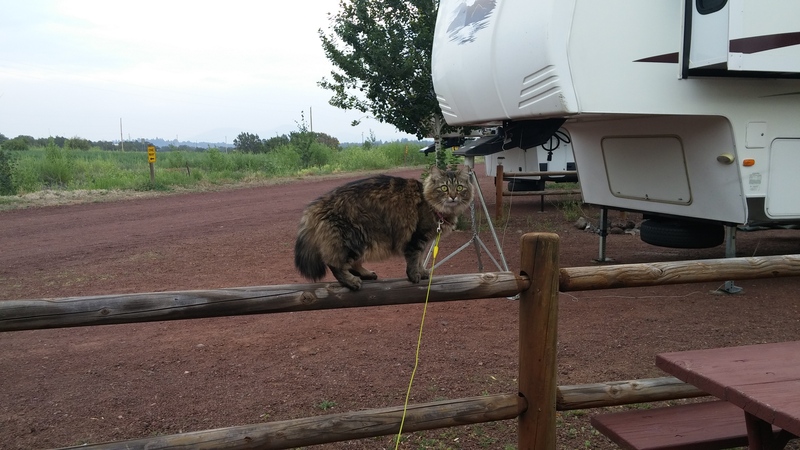 This was at the Trailer Village RV Park right inside the national park. We love staying right in the park because they have bus transportation to take you where you want to go. And they have restaurants and lodges that are fun to visit. I know it’s not much but it was better than nothing. This was Fat Cat’s first experience with snow ever. She didn’t know what to think of the stuff! Later in the afternoon the snow had already melted off the picnic table but it started snowing again so we brought Fat Cat back out to see how she liked it falling on her head. I think her expression in this picture is so funny! In the morning we headed out to check out the canyon before the snow melted. We saw lots of deer out at that time of the morning looking around for some breakfast. The snow on the trees was so pretty! The boys enjoyed a snowball fight. We enjoyed this so much! I know for those of you that live in cold climates where you see snow all winter, this would not be very exciting. I’m sure a warm and sunny beach scene with palm trees would be more appealing. As one of my friends told me, it’s all in your perspective. For us Floridians, snow is a novelty to us and we enjoy it so much when we see it. 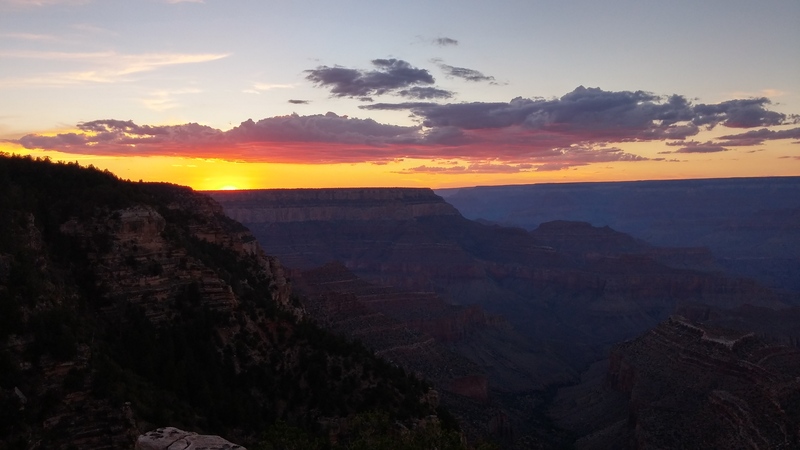 After our one day of snow the weather cleared up and we saw a spectacular Grand Canyon sunset the next evening. We did 2 hikes while we were there. 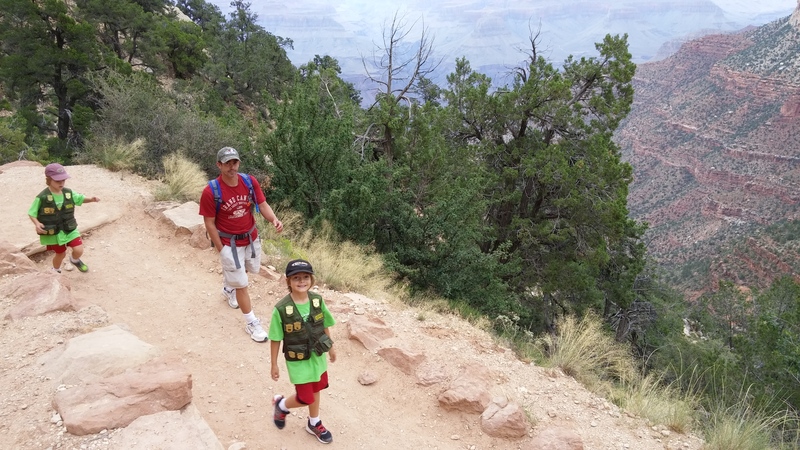 The first one was the Bright Angel trail hike. We started down into the canyon and about a mile down we heard loud thunder and it started to storm and sleet. We know from our visit here 2 years ago that being inside the canyon during a lightning storm can be very dangerous so we abandoned the rest of that hike and went back up. This was the start of the hike and the skies were a little cloudy but not too bad. But then the storm clouds rolled in and it looked pretty ominous. 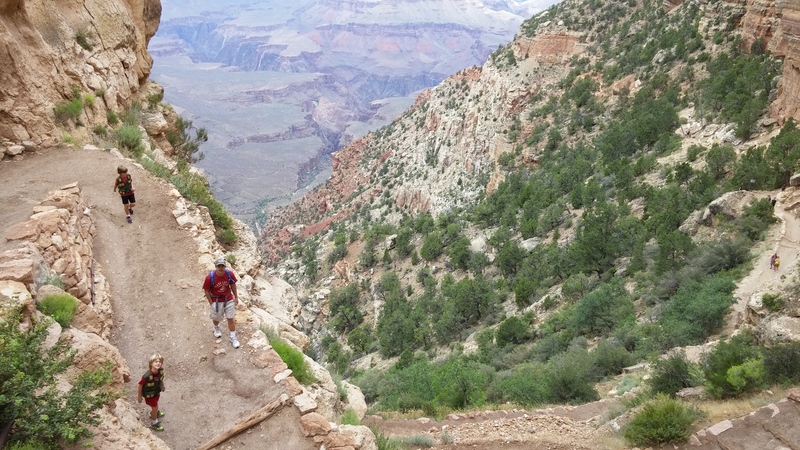 The next day was much better for hiking and we did our favorite hike down the South Kaibab trail. 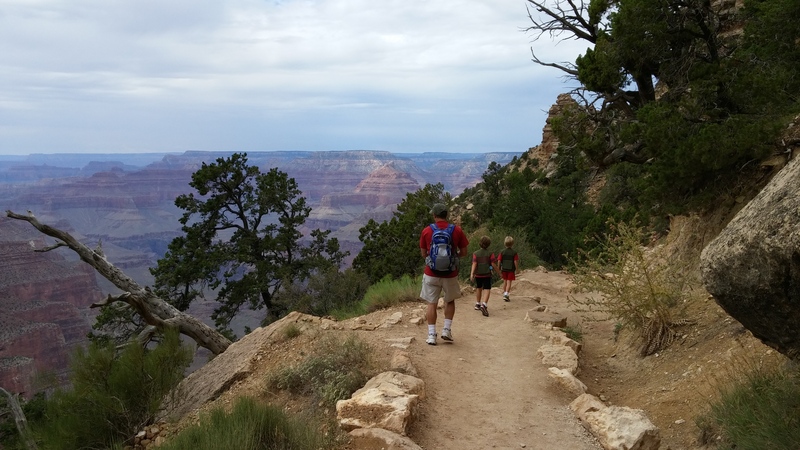 We did this hike 2 years ago, but only went as far as the Ooh Aah Point. 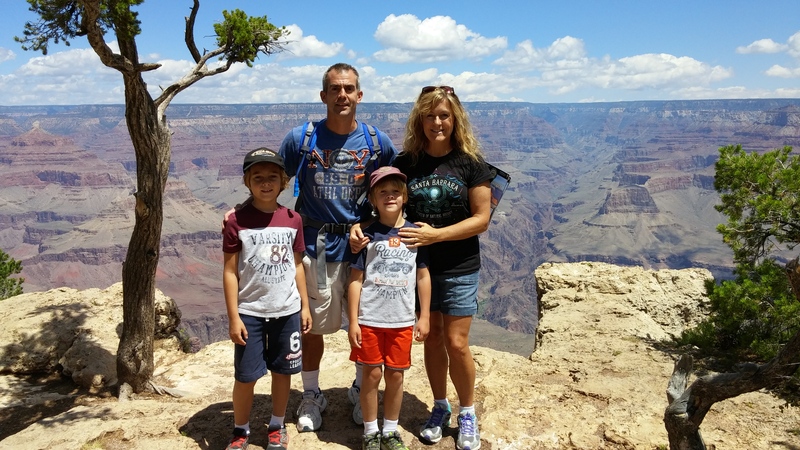 This year we continued on down to the Cedar Ridge Point which was amazing! 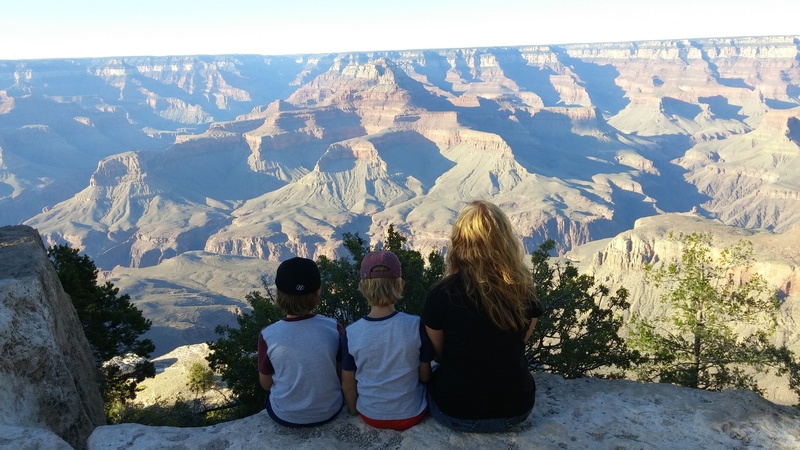 Grand Canyon is such a magical place and definitely one of those places worth going back to again and again. 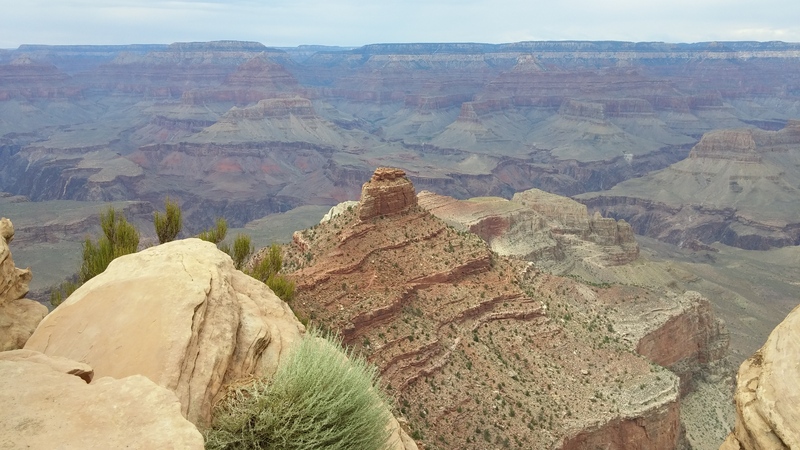 In my last post about Route 66 I mentioned that we spent a day at the Grand Canyon. 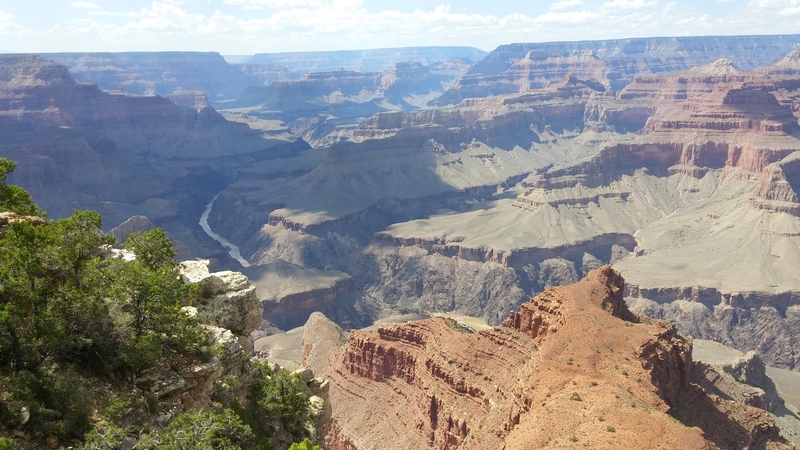 I had heard that when you go to the Grand Canyon, you look at it for a while, take some pictures and you’re done. I wrongly assumed we wouldn’t want to spend more than a day there. 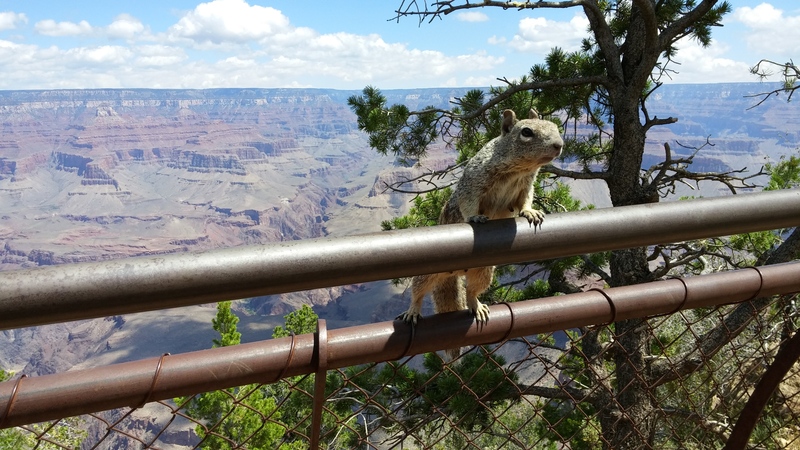 There is so much to see and do at the South Rim, you really could spend a lot more time if you want to. I haven’t been to the North Rim yet so I can’t speak about that. We started the day at the Visitor Center so we could pick up Junior Ranger booklets for the kids to work on, then we walked a lot of the rim trail. They have shuttle bus transportation to take you to many of the points at the park. The Orange bus route will take you to the east side of the park which is the least crowded. You can also see beautiful sunsets from there. 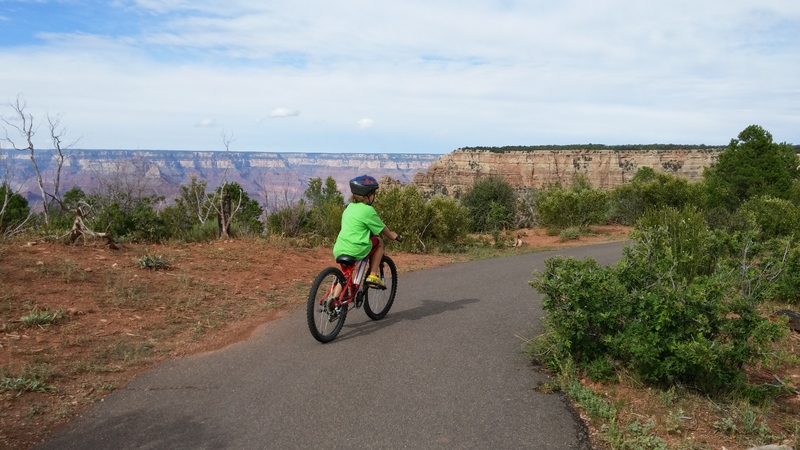 The Blue bus route takes you around the Grand Canyon Village which includes 2 campgrounds, a hotel, a few lodges and several places to eat and shop. They even have a grocery store and a U. S. Post Office! The Red bus route will take you to the Hermit’s Rest on the far west side of the park with many scenic viewpoints along the way. We went on all the bus routes that day and tried to see as much as we could since we had only planned one day there. This squirrel was so cute and not the least bit afraid of people. He tried to steal Chris’s banana right out of his hand! 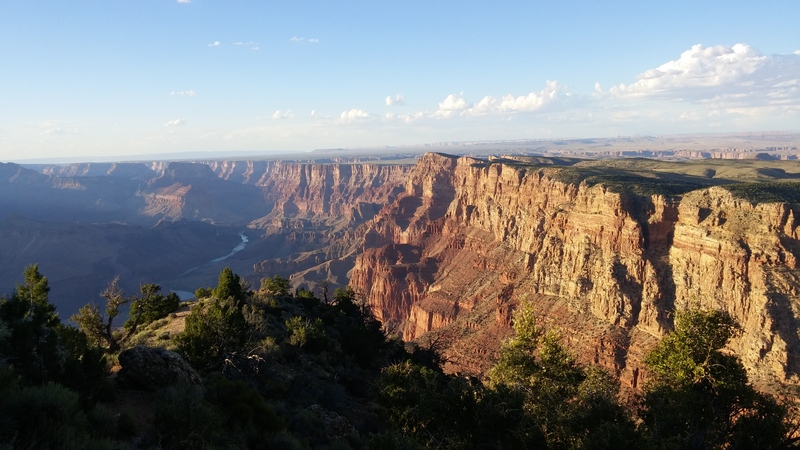 You can see the Colorado River winding through the canyon in the picture below. I loved this sign outside of one of the gift shops. It was so appropriate to go along with the magnificent scenery of God’s Creation. I saw many people standing out on narrow ledges getting their pictures — this was as close as I got. This is how the boys entertained themselves while waiting at one of the shuttle bus stops. I love how they so easily entertain themselves! We thought sitting on the ledge would make a nice picture. Or maybe hanging off the ledge instead? 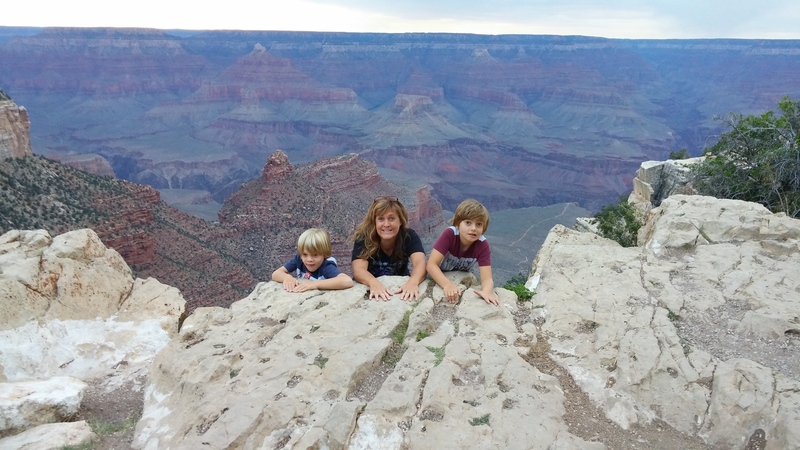 We enjoyed this day at Grand Canyon so much and already were making plans to come back next year. Well, it turns out we were able to return sooner than we thought. 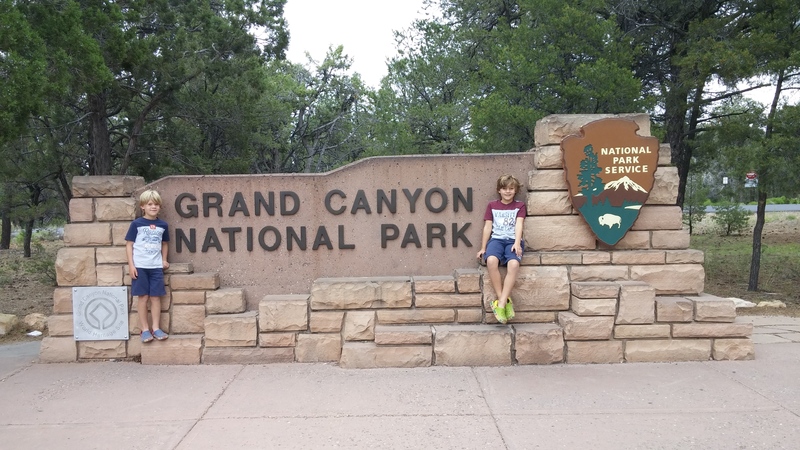 We went to Cottonwood, AZ to stay at a Thousand Trails and had planned to visit some national monuments in that area. It turned out to be a bad time to visit that area as it was over 100 degrees. We immediately started searching for some place else to go that was cooler. 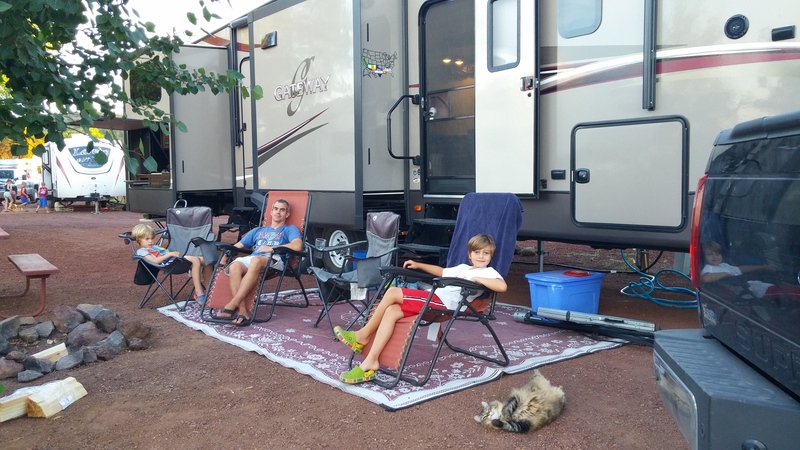 Previously I had wanted to stay at the full hookup campground in the Grand Canyon called Trailer Village. 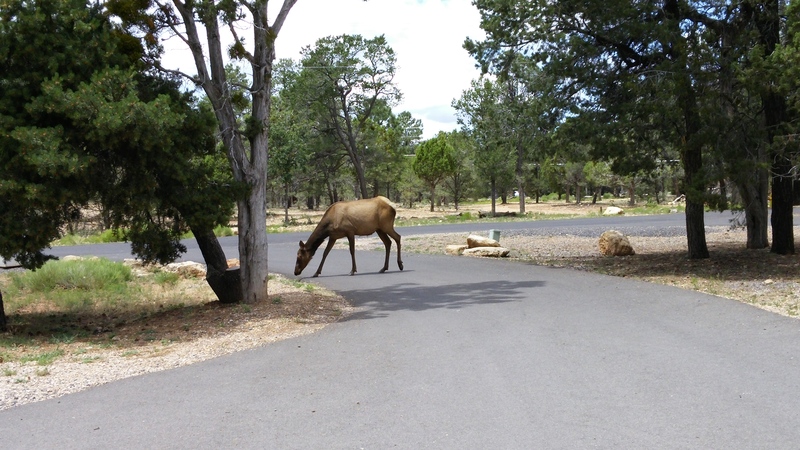 It is very hard to get into that campground without making reservations way in advance. While we were in Cottonwood I kept checking their website and eventually found 3 consecutive nights available that week! 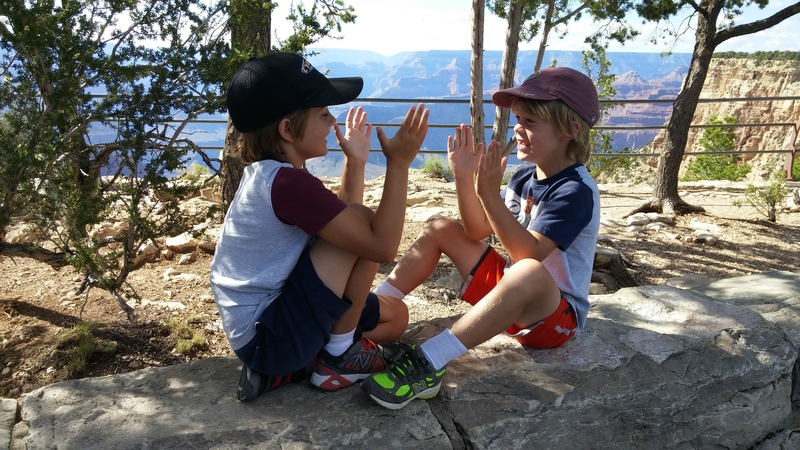 We hitched up and left the sweltering heat of Cottonwood and headed to the cooler temps in the Grand Canyon. It’s really nice to have a house on wheels so we can move whenever we feel like it. Trailer Village was awesome and I would highly recommend it to anyone wanting to stay at an RV Park in the Grand Canyon. It’s so convenient to have the bus transportation and all the other amenities available right there like stores and restaurants. We enjoyed this campground so much and were able to extend our stay 2 more nights while we were there which gave us plenty of time to more fully explore the area. 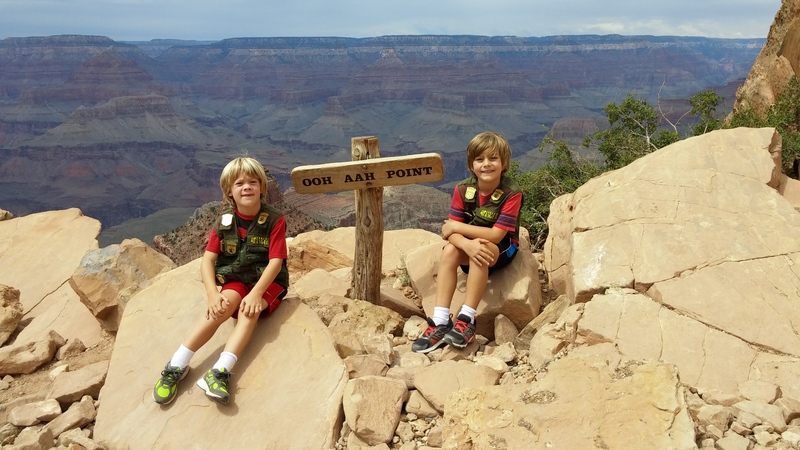 When we were there the previous week for one day, the boys were not able to earn their Junior Ranger badge because we didn’t have enough time to do one of the required activities which was to attend a Ranger program. 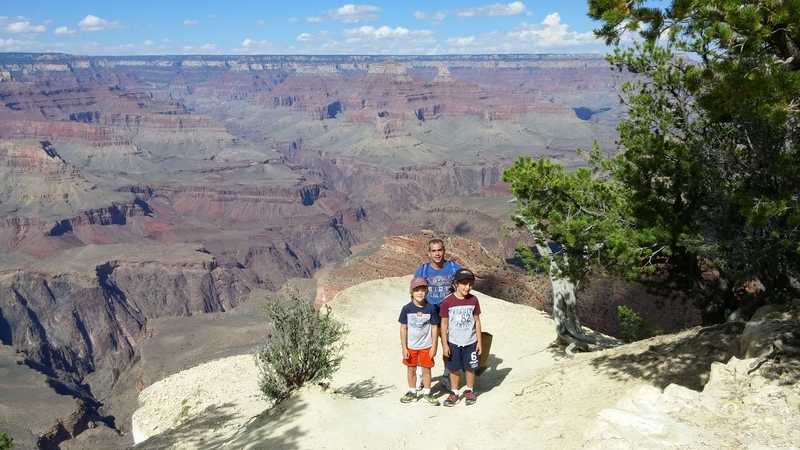 We were able to get that completed on this second trip and they were happy to earn the badge for this famous park. 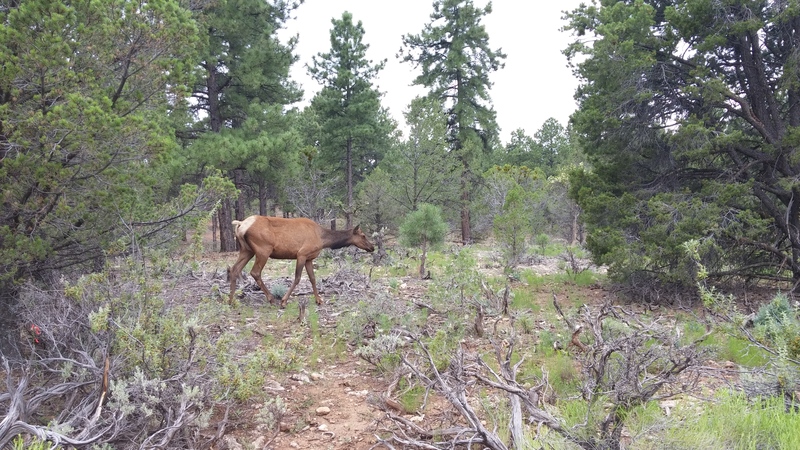 We saw so many elk wandering through the park, even right by our campsite. 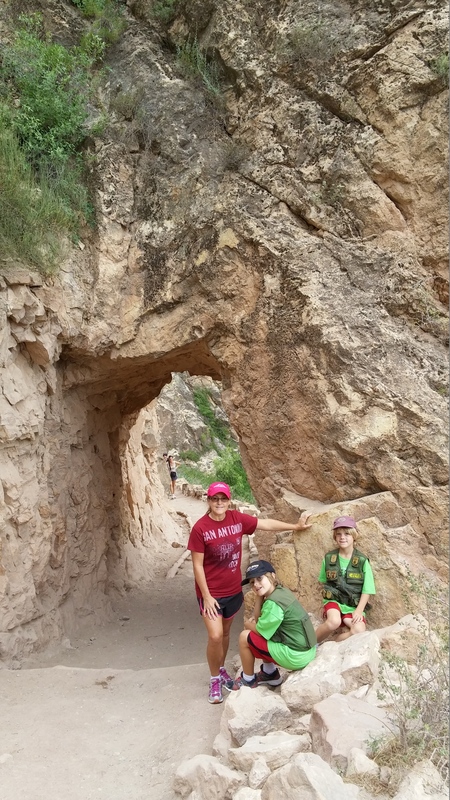 With more time we were able to go on a couple of hikes into the canyon. We did not go all the way to the bottom. It is recommended that if you plan to go to the bottom, all the way to the Colorado River, that you don’t plan to do it in one day. 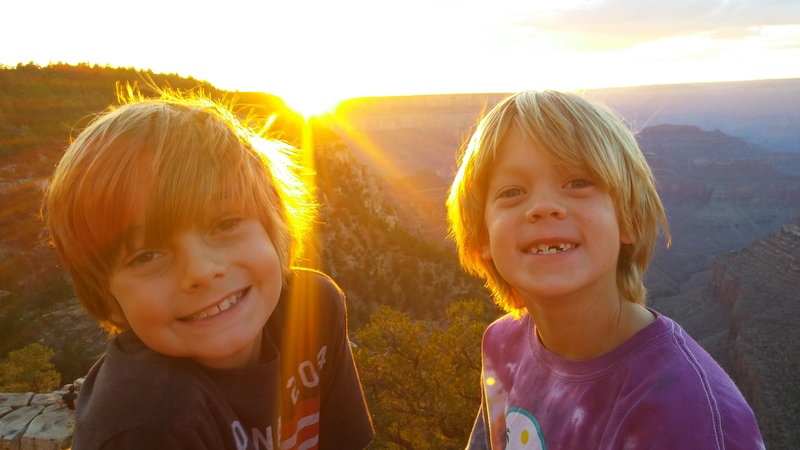 You need to plan to spend the night in a tent in the canyon. 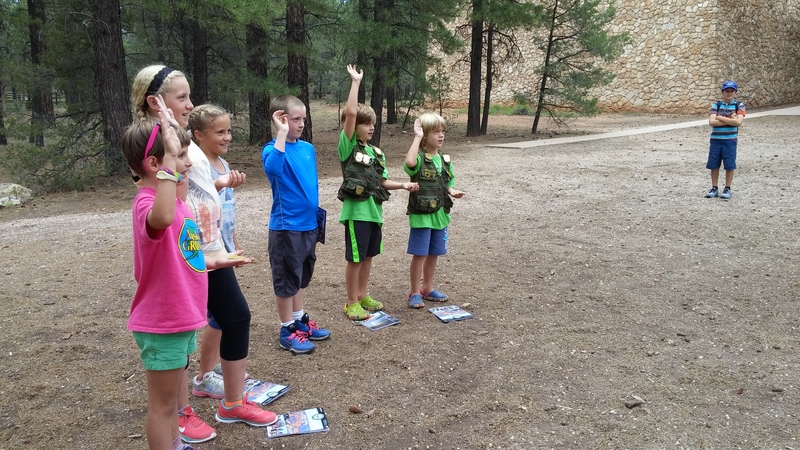 They have ranger programs down there and plenty of people do camp overnight, so our kids have made up their minds that they want to do that next year. I don’t know if I’m up for spending the night in the canyon with the scorpions so stay tuned to see if that really happens. 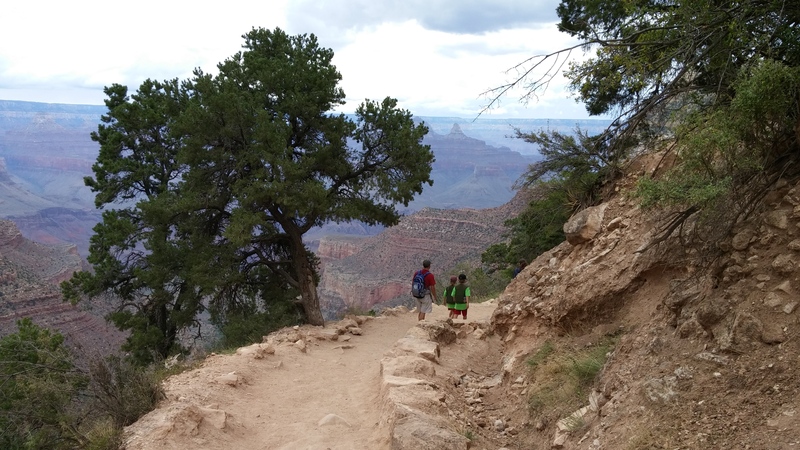 Anyway, we at least wanted to hike to the Ooh Aah Point because as part of the FtF Book Club we are reading books about a family that visits many different national parks. We recently finished the book about the Grand Canyon and this was one of the points they mentioned in the book. So of course we had to find it! Here are some pictures from that hike. 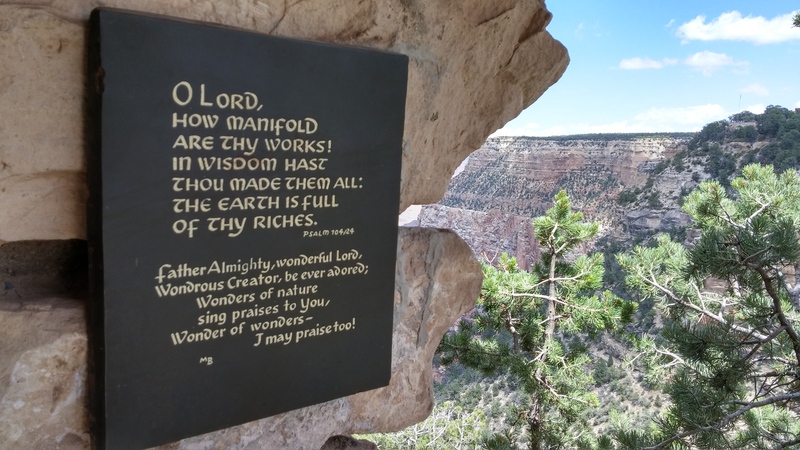 The next day we hiked down the Bright Angel trail to the upper and lower tunnels. The boys love wearing their Junior Ranger vests with all of the badges they have earned so far. Many other hikers on the trails stopped to compliment them on their badge earnings and to see all the places they have been. In fact, many people on the buses also asked them about their badges and travels. These vests generate a lot of attention! After that hike the boys and I went for a bike ride. Chris couldn’t join us unfortunately because his bike was stolen back in California, but I don’t think he was too disappointed. It was Sunday and after our 2 hikes that weekend he just wanted to chill out and watch whatever sports happened to be on tv. 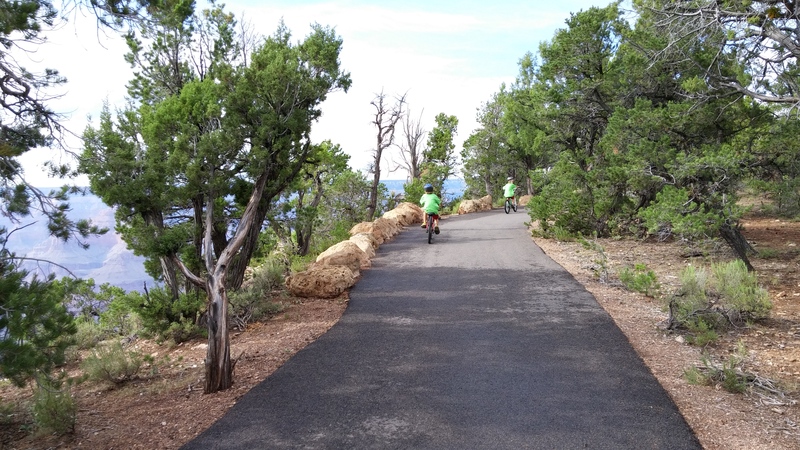 The bike trails there were awesome and can be accessed right from the campground. The views are priceless! 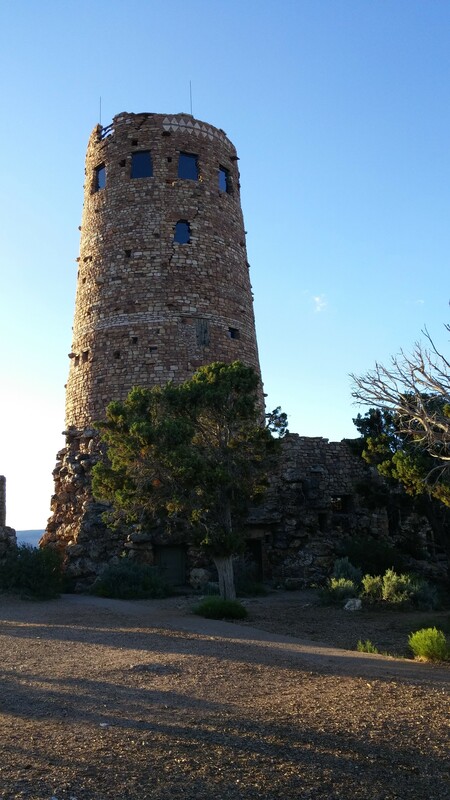 We heard that you can see the best sunsets from the Desert View Watchtower which is way at the east end of the park, about 25 miles away. The shuttle buses don’t go that far so we drove. Unfortunately we didn’t know that they don’t let anyone up in the watchtower after 6:30 and we got there at 6:35. That was very disappointing because it was our last night there, but I was still able to get a couple of nice pictures. 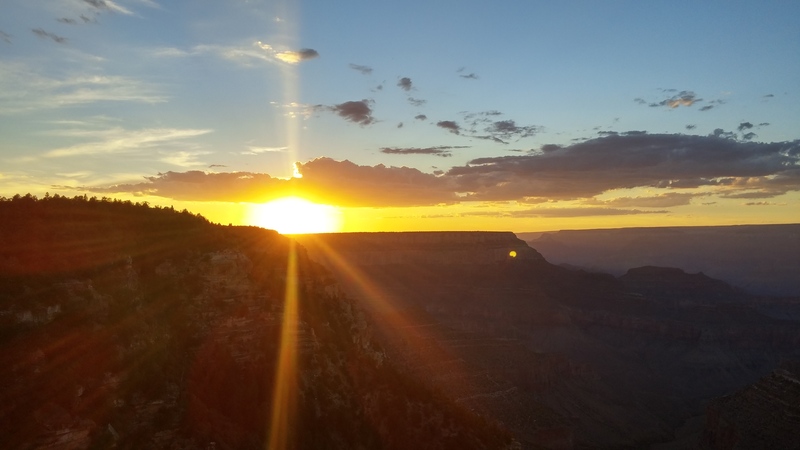 The sunsets at the Grand Canyon are the most spectacular I have ever seen! A couple of cute photo bombers. 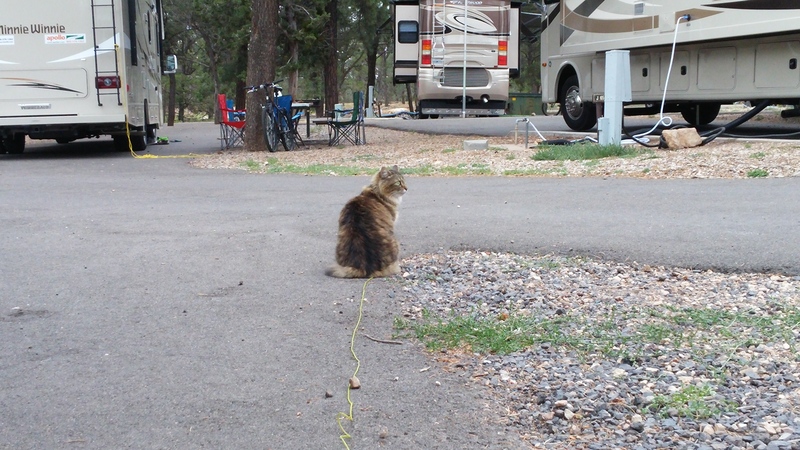 And for all of you Fat Cat fans out there, you’ll be happy to know that she also enjoyed her time at the Grand Canyon. The pictures below were actually at a stop-over in Williams before we were able to get into Trailer Village. She was rolling around on the ground so happy to be out of the sweltering heat of the last campground. It’s really amazing how the temperature can be so different only an hour away. 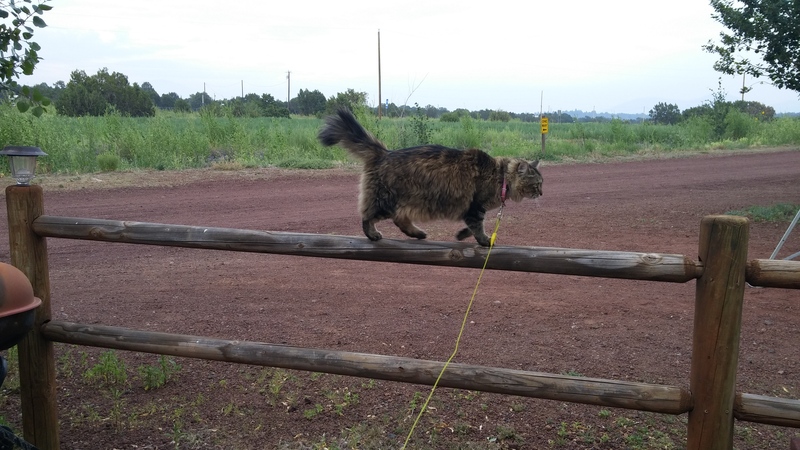 The cooler weather gave her so much energy she decided to learn how to walk the fence. 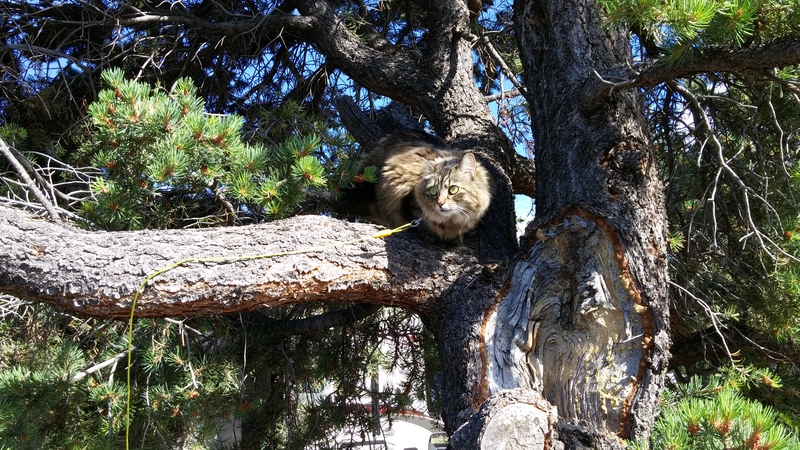 And at the campsite at Trailer Village she liked practicing her tree-climbing skills. And she’s learning to be a watch-cat. 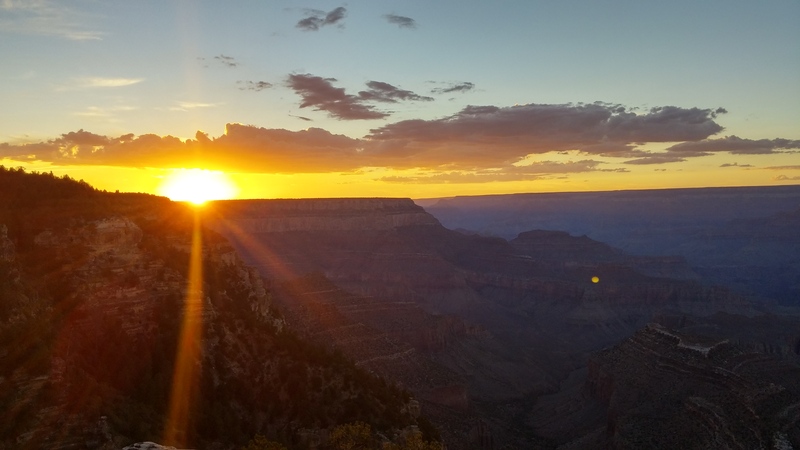 I hope you enjoyed this post about the most visited national park in America. It definitely was crowded, but I’m so glad we were able to spend more than just one day there.